Siemens Enterprise Communications (SEN for short), corporate telco arm of the eponymous German industrial giant, looks set to enter into an almost-joint venture with American private equity outfit Gores Group after the European Commission has decided the move is not anti-competitive. Gores Group is, in its own words "a private equity firm focused on acquiring controlling interests in mature and growing businesses which can benefit from the firm's operating experience and flexible capital base." SEN describes itself as "one of the world's leading providers of Open Communications solutions." It provides corporate telco solutions like telephony, networking and so on, presumably competing with the likes ofCisco, BT and perhaps even Microsoft. The planned joint venture, of which Gores would own 51 percent and SEN 49 percent, was first announced on 29th July. Gores will be contributing networking company Enterasys and call-centre technology outfit SER Solutions to the joint venture, while both parent companies will be investing €350 million to get things going. Here's a photo taken when the deal was first announced. 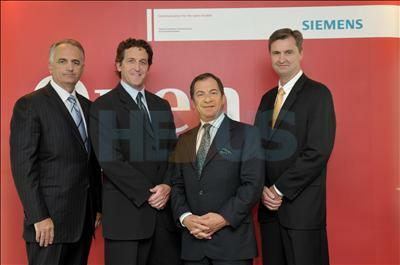 From left: Steven Yager (Senior MD, SEN), Mark Stone (Chairman, SEN), Alec Gores (Founder, Chairman and CEO of the Gores Group) and Michael Brandt (Senior Vice President of Glendon Partners).